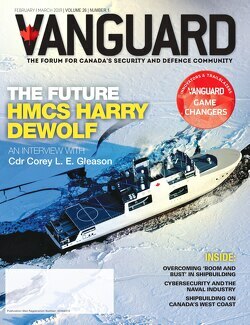 Documents released by an Ottawa court yesterday indicate that the Royal Canadian Mounted Police is accusing the Vice-Admiral Mark Norman of leaking information about a cabinet meeting about a $667 million contract to provide the navy with an interim supply vessel. The documents released by the court included an affidavit and other materials such as emails which police obtained from a search of Norman’s residence earlier this year. Results of the RCMP’s 16-month investigation, called Project Anchor, found that top ranking naval officer provided information about the cabinet meeting to a shipbuilder based in Quebec what was opposed to the interim supply ship plan. If found guilty of a breach of trust under the Criminal Code, Norman could face a sentence of up to five years in prison, according to a Globe and Mail report of the developments yesterday. The RCMP also allege Norman violated the Security of Information Act. Executives of Chantier-Davie Canada Inc., some lobbyist, as well as senior cabinet ministers, including Treasury Board President Scott Brison, were also interviewed by the RCMP, the newspaper said. The documents show that the criminal probe has expanded to include interviews with prominent Ottawa lobbyists and executives of the Chantier-Davie Canada Inc. shipyard in Levis, Que. “Norman is suspected of having committed a Criminal Code section 122 breach of trust offence,” Cpl. Matthieu Boulanger of the RCMP wrote in an affidavit to obtain a search warrant to search Norman’s Ottawa home on January 9th. The Mounties also allege Vice-Adm. Norman violated the Security of Information Act. The RCMP also alleges that Chantier-Davie shipyard and a sister company were trying to get the Trudeau cabinet to honour a contract the former Conservative government had with the shipyard. The contract was signed on the last day of the 2015 federal election in October. Under the deal signed with the Conservative government, Davie will retrofit a civilian tanker to serve as a military replenishment ship. The navy had earlier retired two of its 45-year-old replenishment vessels and is currently waiting for its replacements to be built. The new ships are expected to arrive in 2020. After winning the election, the Liberals had put on hold the supply ship project after receiving letters from two other giant shipbuilders, Seaspan, in Vancouver and Irving Shipbuilding, in Halifax, urging the new government to revisit the bidding process.